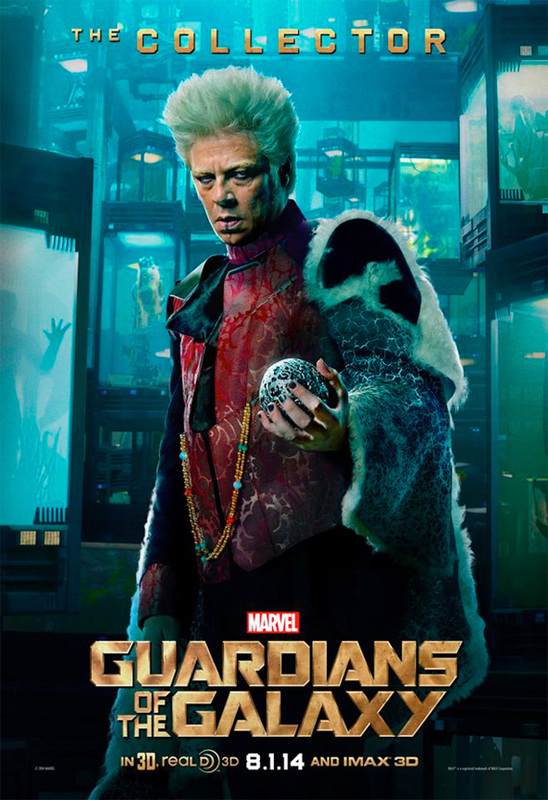 Since the credits teaser at the end of Thor: The Dark World featured Benicio del Toro as The Collector, it almost seems like we've gone full circle since the character now gets his own poster for next month's release of Guardians of the Galaxy. This should be the final character poster following other supporting characters like John C. Reilly and Glenn Close from Nova Corps and the trio of bad guys led by Ronan (Lee Pace) also got their own character posters, but with Marvel anything is possible. It would take someone like The Collector to round up all the Marvel character posters that get release with every new film. Look below! Am I crazy... or is there an extremely obvious wig line on his forehead? Dang...I was thinking the same thing!! I came down to post that exact comment! I think you're dead on...strange the 'shoppers would let that slide. Ok........ now Thanos.................. and now Thanos...................... AND NOW THANOS! The costume is great. He reminds me of Kramer.